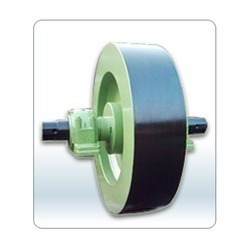 We are one of the leading firms, offering Rolling Mill Flywheels. This product is mainly a rotating disk which serves as a storage device for kinetic energy. By resisting changes in rotational speed, it helps us in steady rotation of the shaft when an uneven torque is exerted on it by its piston based power source. Alternatively, it also serves as an energy storage device. This product is also used in small motors for storing energy over an extended duration of time and releasing it over a short period of time, which temporarily magnifies power output. This item can be availed from us at industry leading prices. Manufacturers of complete steel re-rolling mill plants and allied machinery, all type of gears and gear boxes for any industry, forgings, steel castings, adamite and s.g.iron rolls.